The third round of the Trophyland Cup got underway on Sunday with eight sides vying for places in the quarter finals, three of those sides facing opposition from a higher division. In one of the games of the day, Masterman almost caused a big shock against Barking as Lewis Foster scored a hat-trick, accompanying efforts from John Bruce and Harry Rixon onto the scoresheet. But Barking braces from Jordan Cook and Michael O’Brien plus goals from Aaron King and Charlie Surridge earned them a 6-5 win after extra time. Also safely navigating through a potentially difficult looking tie were Ferns Seniors who continued their form with a victory over Division Three’s table toppers, Central Colts. Liam Coney scored twice and Lee Niven once for the hosts as Ferns secured their place in the quarter finals of the competitions in their inaugural season in the competition. Thames Ironworks Community had a morning to remember as they stroked an astonishing thirteen goals past an unlucky Alliance United side who had no reply on the day. Wayne Gittens stepped up to score four goals for Thames with Charlie Kerr and debutant Jeffrey Nketia scoring twice each. Single strikes from Ewan Macauley, Lucas Argente, Bradley Williams, Allan Smith and Paul Scanlan done further damage to win 13-0. The day’s domestic cup action was completed at West Ham Park where two of Division Four’s sides, AC Milano Reserves and East Ham Inter went head to head with both sides eager to continue their progress in this cup competition. Michael Kemp returned to the Inter side with another brace with Adam Bessadi and Delphin Xavier goals completing a 4-2 Inter win. In the top flight, Repton Park’s lead at the top was extended to eight points following a big home win in Loughton over FC Mexico. Jobe Ambrose’s hot streak this season continued with a hat-trick haul, Jesse Spearing scored twice and one each from Ciaran Kelly and George Johnson finished off a 7-3 win. Mujib Ayoola scored twice for the Mexicans in return with Joe Ewenson also on target. Moving up to fourth place in the table were Flanders who recorded a fifth league win of the season so far with a big home win against Ultimate Vision. There were two goals apiece from Frankie Sinclair and Shomari Barnwell with one each from Jeremiah Duah, Kweku Gyasi and King Sayi to round off a stunning 7-2 scoreline in their favour. The Division One action saw two identical scorelines as Wanstead Albion secured an important fourth point of the season against Valiant as they continue their quest to avoid the drop this season. Jerald Aboagye and Tyriquee Soloman each netted for Albion but Valiant levelled it up through efforts from Ben Cox and Jacen Worboyes to make it 2-2. And reflecting that scoreline was the battle between Westferry Elite and Valentine United at Wanstead Flats where Elite were probably odds on to record a first victory of the season as they led by two goals. But United didn’t give up the ghost and managed to level proceedings through goals from Josh Russell and Jonathan Day to finish level at 2-2. As games go they probably don’t get as topsy-turvy as the clash between Bretons Manor and Lonsdale who battled away to produce a stunning nine-goal thriller. Lonsdale came from behind to lead 4-2 at the break through a Klodian Gjings brace and one each for Geoffrey Holmes and Kalium Fletcher. But a second half Manor fight back culminated in a levelling it up then winning it 5-4 late on with Greg Bowles scoring two and one apiece from Jack McAllister, Luke Sargent and Kane White. After a difficult few weeks where form has been inconsistent, FC Kulture Klub put themselves back in the frame for promotion as they secured a big 4-0 home win against fellow promotion hopefuls Goresbrook. Kulture’s win, their sixth of the season, moved them level at the top on goal difference but with the sides around them still having games in hand. The remaining action in Division Two centred around a battle at the other end of the table where Walthamstow Avenue made the trip to Hainault to face a London Fire Brigade occupying the place above them and just two points separating them pre-game. Two goals from Yomi Popoola and Jeff Harrison plus a Samuel Redfern goal were the difference for Fire as they romped to a 5-1 win. Goals were the order of the day in Division Three, particularly in the day’s action at Castle Green where Dagenham United Reserves gave up a lead consisting of goals from Joshua Craske, Zachary Hayles-Lee and Jay Simmons in their clash with E4 Rangers. The visitors fought back with a brace from Tim Dye and other efforts from Mitchell-Christopher Edmonds, George Noonan and Kobie Ambrose to win it 5-3. There was a massive result elsewhere in Dagenham with Roneo Colts moving to fifth in the table following a fourth league win of the campaign, defeating a promotion chasing Alpha side. James Pottle was the hero for his side, netting a hat-trick with Sam Baohua getting the other goal in an eventual 4-0 win for Colts. Newham Athletic moved back to the summit of the Division Four standings as they continue to trade places with Woodford at the very top. They were aided by a 6-1 win over the weekend, taking home all three points against Oak Royals. Leon Anderson scored twice with Kane Greene, Joseph McEnroe, Del Carver and Conrad Cayanyab all finding the back of the net. Also putting six goals passed their opposition were Monkhams who continue to impress in their maiden campaign, sitting solidly in sixth place in the standings approaching the half way point. Epping Forest Falcons were the unfortunate victims on this occasion with only a Ricky Bronson effort to show for their efforts. Thomas Overton scored twice for the hosts in reply with Samuel Griffin, Aaron Francis, Sam Snell and Revan Tish efforts completing the win. The remaining Division Four action saw Custom House Community exact a degree of revenge for a heavy defeat against Grey Area in their opening game earlier in the season by taking a point off their opponents this time around. Kelvin Bartlett was one of the scorers in an eventual 2-2 draw at Terence McMillan to settle for a share of the spoils. There were some stunning performances by Corinthian sides in the county cup competitions with all four Essex sides making safe progress to the quarter finals of their respective competitions. In the Essex Sunday Junior Cup, Barking & Dagenham Wanderers were 4-2 winners over a tough looking Greyhound side from the Harlow & District League. That win sees them through to a mouth-watering quarter final against Belfry in January. Also making safe passage into the quarter finals are Dagenham United who made home advantage count in their clash at home to an Aveley Academicals side with just a single defeat to their name this year. It took ten goals to pull the sides apart but the Daggers were on the right end of a 6-4 scoreline to go through. In the Essex Sunday Junior Trophy, Royal Albert faced a difficult trip up the A12 on Sunday morning as they visited Colchester based CO4 Ultras with a quarter final place on the line. The best tonic for a long journey is to return home with a win and that was exactly Albert’s plan, securing an emphatic 5-1 win to go through. And completing the Essex county action, there was one of those mouth-watering match-ups between Combination and Corinthian sides as Recreativo Romford played host to Hornchurch Oakmont in Dagenham. After a great run to this stage, Oak will carry their quest into the new year, edging the contest by the odd goal in five to win 3-2. 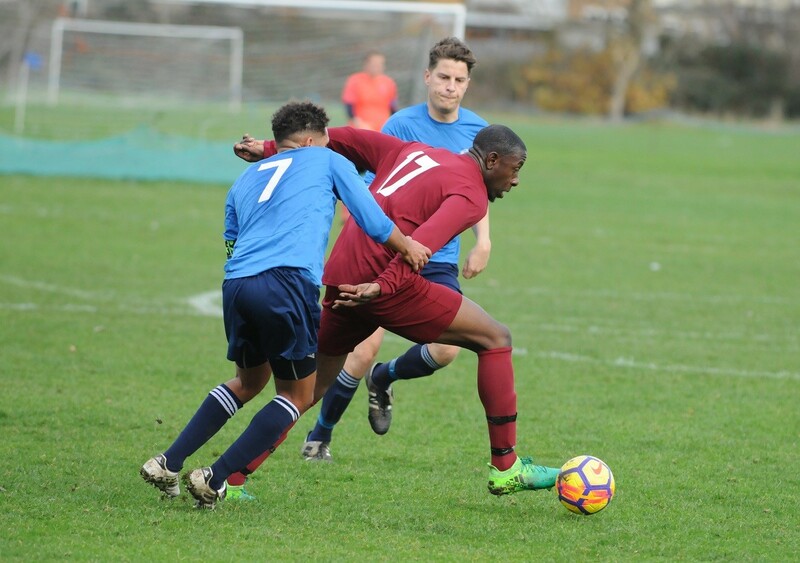 In the London Sunday Junior Cup, it has been a good run for Asianos Reserves who have faced some long away days into the vast expanses of the capital, none other than their trip to south London on Sunday to face FC Karpaz. The dream finally came to an end for Asianos with a 4-0 defeat seeing them exit the competition.